The Raspberry Pi 3 provides enough computational power to make it a viable replacement for an old computer. Building on the legacy created over the last four years this board will power many more projects to come. Has it really been four years since the Raspberry Pi blasted onto the single-board computer scene? Well, it has and to celebrate the Raspberry Pi Foundation has released its latest version, Raspberry Pi 3, which is more of an evolution than a revolution. The latest Raspberry Pi from the Raspberry Pi Foundation is here. Following the Raspberry Pi 2 from one year ago, it has new wireless connectivity and an improved processor that lowers the cost of having a desktop computer and opens the door board to exciting new projects from simple servers to complex sensor networks and much more. Powered by a BCM2837 SoC (System on a Chip) and featuring a 64-bit ARM Cortex A53 quad core processor running at 1.2GHz, the Pi 3 has quite a powerful processor. However, there's no RAM upgrade this time, which leaves it with 1GB of RAM. There is a subtle upgrade on Pi 3 is the VideoCore IV which handles video and graphics now clocking in at 400MHz compared to earlier models at 250Mhz. Physically the Raspberry Pi 3 looks very similar to the Pi 2; the only noticeable changes are the locations of the status LEDs and a new chip on the underside of the Pi. This chip is the BCM43438, which provides Wi-Fi b/g/n and Bluetooth on the board, and removes the need for USB dongles. Bluetooth 4.1 provides both a classic and low energy (LE) method of connecting to devices. Bluetooth LE is an exciting prospect as it enables low-power hardware applications, such as beacons, that can interact with devices such as smartphones and tablets. Cleverly, the antenna used for wireless communications is located on the outer edge of the board, just out of the way of any add-on boards that may interfere with the signal. In our tests we found the Wi-Fi to be as sensitive as the official Wi-Fi dongle and just as easy to use. Built-in wireless communications is a big deal for the Raspberry Pi and enables the Pi to be used as a an IoT (Internet of Things) platform for very little outlay. To use these new wireless components you'll need to update your Raspbian image to the latest version or download and flash the latest image to an 8GB or larger micro SD card. The latest Raspbian image also comes with refinements needed for the Pi 3, such as new firmware that will enable the Pi 3 to run at full capacity. These new wireless devices do come at a cost, with the Pi 3 consuming nearly one and half times more power than the Pi 2. This means that the Pi 3 needs a reliable power supply, with a recommendation being a 2.5A power supply when being used with add-on boards that use motors or neopixels. The Pi 3 comes with four USB ports and an Ethernet port, which provides Fast Ethernet, 100Mbit/s, and is routed via the LAN9514 chip, which has been the standard since the Model B+ Pi was released in mid 2014. Many have criticised this decision as it prevents the use of Gigabit Ethernet, but adding that to the board would have increased the cost above the magic $35 (around £32, or AUS$47) price point. The Pi 3 provides an incremental speed increase when compared to the Pi 2, figures quoted by the Foundation state around 50-60% when running 32-bit code on the new processor. Currently, OSes do not yet use the chip's 64-bit mode; the speed boost is mainly due to a series of architectural enhancements. The Raspberry Pi 3 is a remarkable piece of technology. 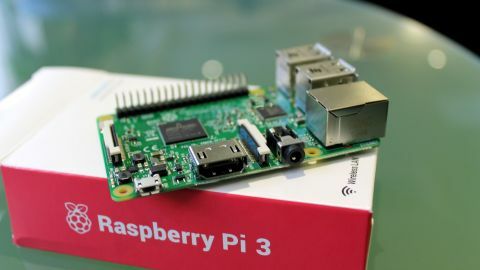 True, it may not be the most revolutionary upgrade from the Pi 2, but it builds upon a rich community of support and maintains a level of backwards compatibility to boards and projects created for earlier models of Pi to be used. The arrival of wireless communications on the board enables IoT projects at a lower price point and helps further the goal of the Raspberry Pi, providing a platform for tinkering and experimentation that's low cost and well supported. This review of the Raspberry Pi 3 was originally published in Linux Format. Click here to subscribe.